Please let us know if you will be attending the Warrington ceremony to help us plan the event accordingly. All Warrington College of Business graduates are encouraged to attend the Warrington Graduate Recognition Ceremony where they will be individually recognized and celebrated. This event is a college-specific ceremony that will celebrate individual student achievement at all levels from the Heavener School of Business, the Hough Graduate School of Business, and the Fisher School of Accounting. Your family and friends are welcome to join us in celebrating your accomplishments. The ceremony is free and open to the public; tickets are not required. Be sure to share your graduation moments on social media by using the following hashtags. Graduation is a special occasion that allows us to celebrate the impressive accomplishments of all Warrington graduates. We applaud your achievements and look forward to the impact you will have as Business Gators. Yes! All Warrington College of Business Spring 2019 graduates will be recognized by name as they cross the stage. Is the Warrington event for all majors? The Warrington College of Business Graduate Recognition Ceremony on May 3rd at 7:30 PM is a college-specific ceremony where we will recognize and celebrate ALL Warrington College of Business graduates – bachelor’s, master’s, and doctoral candidates. Graduates will be individually recognized as they cross the stage. The University-wide Commencement on May 4th at 8:30 AM is a ceremony that will be open to all gradating UF students. This ceremony will feature a speaker and degrees will be conferred by college. Do I need tickets to attend the ceremony? No, tickets are not required to attend the Warrington Graduate Recognition Ceremony or the university-wide commencement. Don’t forget to bring your name card. You’ll receive a name card when you pick up your regalia from the UF Bookstore. 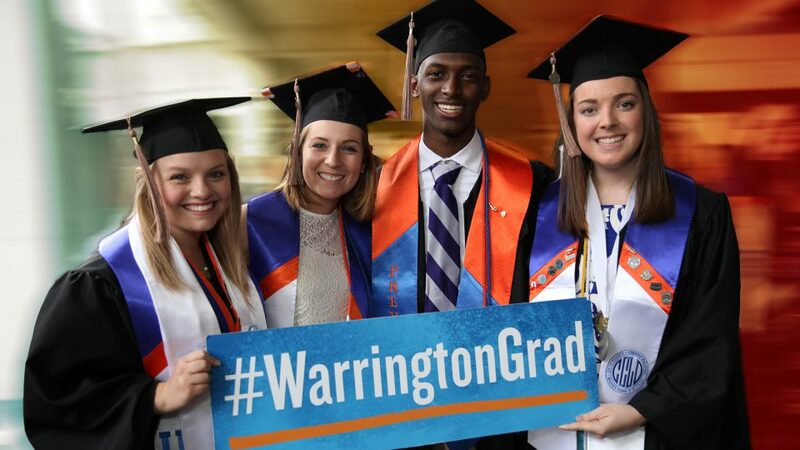 You will not need a name card if you choose to attend the university-wide ceremony at Ben Hill Griffin Stadium, but you will need it at the Warrington Graduate Recognition Ceremony. Please take the time to write the phonetic spelling of your name in the appropriate location on the card prior to the ceremony. For more information, please review the University’s guidelines on name cards. Live streaming will be available for the Warrington Recognition Ceremony. A link will be provided here once it is available. What time does the ceremony actually start? Spring 2019 ceremony will begin at 7:30 PM, with the processional starting at 7:00 PM. All guests should be in their seats before the processional starts. Guests will enter the O’Connell Center through the main entrance doors near Gate 1. Doors will open for guests 90 minutes prior to the start of the ceremony. Guests should be seated before the procession begins. Guest seating is first-come, first-seated. No guests will be permitted in the graduates’ seating area. First, contact the UF Disability Resource Center. The Warrington commencement team will be notified and will work with you to find a solution that is right for your need. Parking will be available at the O’Connell Center. View the UF campus map. 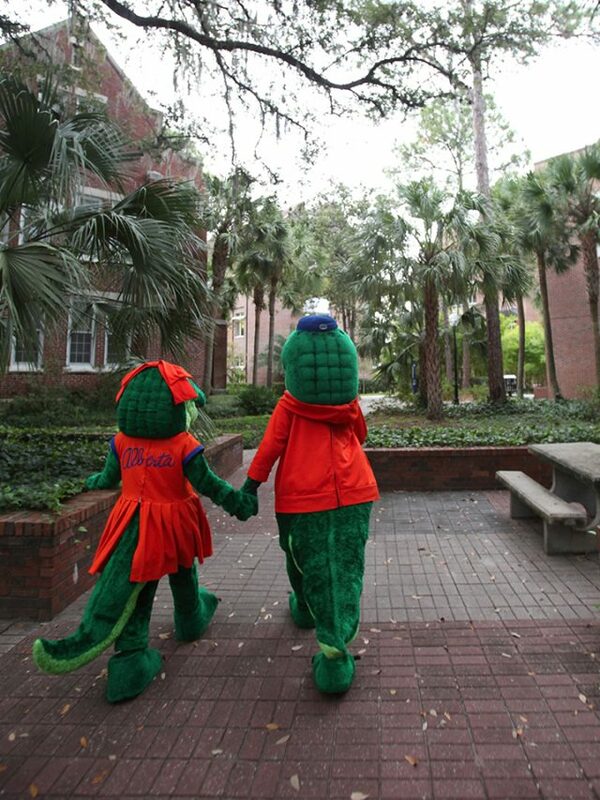 We have plenty of resources to help you plan your trip to Gainesville and the University of Florida campus. You can find transportation information, as well as hotels and points of interest. We want you to enjoy the best of Gainesville while you are visiting our campus. Food will not be served at this event. However, refreshments will be available for purchase and the concession outlets in the O’Connell Center. Find additional Gainesville dining information. What if I’m walking out of term? If you plan to walk out of term, you must first contact your academic advisor and submit a college petition for prior approval. Only students with prior approval will be permitted to order regalia and participate in the ceremony. Students who are walking out of term will not be recognized in the printed program, and their degree will only be conferred upon satisfactory completion of all graduation requirements. Learn more about transportation & parking, as well as hotels and points of interest. We want you to enjoy the best of Gainesville while you are visiting our campus. Spring 2019 graduates may attend two ceremonies – the university-wide ceremony in The Swamp and the College Recognition Ceremony in the O’Connell Center. More information about the university-wide event can be found at the UF Commencement page.